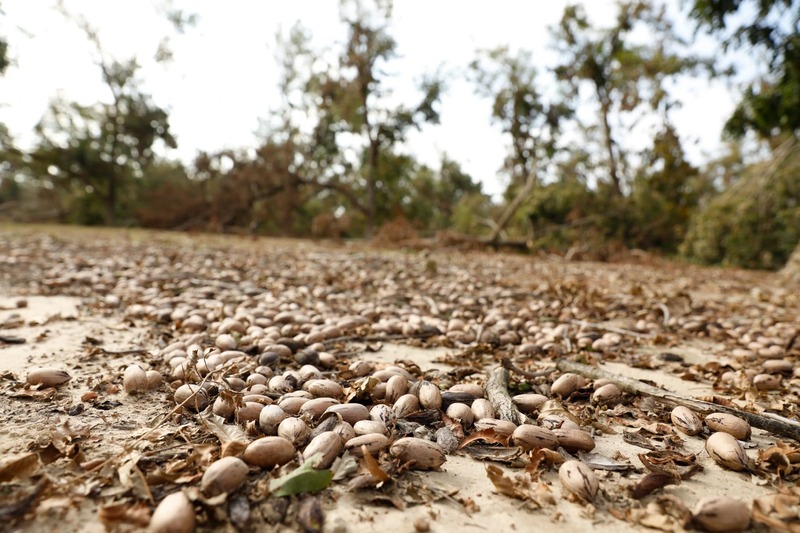 Pecans lie on the ground beneath 20-year-old pecan trees that were uprooted when Hurricane Michael blew through Decatur County, Georgia. Two snowstorms affected parts of Georgia in January 2018. Early in the month, snow fell in a swath across south Georgia, bringing 3.0 inches to Alma (the first snow ever on that date, and the second-highest daily snowfall on any date) and 1.2 inches to Savannah on Jan. 3. This was Savannah’s highest snow since 3.2 inches fell on Dec. 23, 1989. On Jan. 17, another storm brought snow to northern parts of the state, with Athens receiving 1.1 inches, Atlanta receiving 2.4 inches, Columbus receiving 2.0 inches and Macon receiving 1.0 inches, all record snowfalls in those areas for that date. The month of February set new records for heat around the state with every National Weather Service station reporting a temperature at least nine degrees warmer than normal. Numerous daily high-temperature records were set during the month. The warm temperatures caused an early break in dormancy in flowering trees and shrubs, including some fruit trees and early blueberries. When colder temperatures returned in March, frost-nipped blooming plants, resulting in reduced yields in some blueberry plants and peach trees for a second straight year. Above-normal precipitation fell in most months of the year, resulting in annual totals which are expected to be in the top-five wettest years on record for most weather stations in Georgia. The associated wet soils, cloudy conditions and high humidity caused nighttime temperatures to be much warmer than normal and contributed to record-setting strings of days with high dew-point temperatures. Athens set a record for 19 consecutive days of measurable precipitation from May 15 to June 2. The wet conditions delayed spring planting and also delayed fall harvest in many locations across the state. A strong high-pressure system centered over the Southeast from late August to mid-October caused record-setting high temperatures, as well as a string of dry days across the region. The dryness and heat led to moderate drought conditions across eastern parts of Georgia by mid-September. The dry conditions, which were experienced over about 9 percent of the state, lasted until early December and interfered with the establishment of winter grains and pastures, but provided some temporary relief from the wet soil caused by excessive rain earlier in the year. Georgia was slightly impacted by the indirect effects of Subtropical Storm Alberto in June, Tropical Storm Gordon in early September and Hurricane Florence in mid-September, as each of these storms grazed the state, bringing moderate rainfall to some area of the state. By far the biggest impact during the tropical season came from Hurricane Michael, which traversed from the southwest corner of the state northeast to Augusta on Oct. 10-11. A wind gust of 115 mph was recorded at Donalsonville by a University of Georgia weather station and the storm was still at hurricane force south of Macon. While several inches of rain fell in some locations, extreme winds caused a 25-mile-wide swath of tornado-force damage from Georgia’s southwest corner all the way to Albany. The impact on agriculture was severe since the storm hit just as cotton and pecan harvests were underway. Estimated losses to agricultural crops and timber topped $3.4 billion.